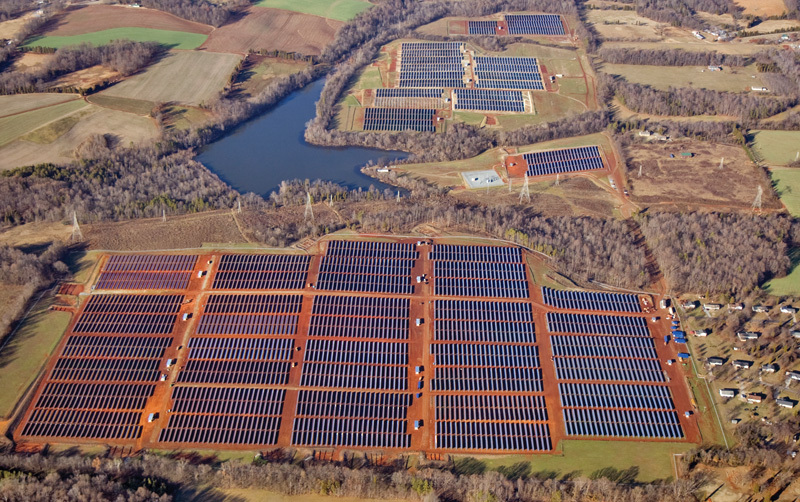 SunEdison utilized a single-axis tracking technology platform on their largest solar farm in the U.S.—a 17.2 MW solar plant with Duke Energy in Davidson County, N.C.,—which is said to be the second largest active solar photovoltaic deployment on the east coast. It was not that long ago that building a 17.2 MW solar plant would have been a considerable challenge. But after talking to Jason Stevens, vice-president of global project operations for Sun Edison, it seems like the new Davidson County solar plant in North Carolina went up like any other. It was just larger—considerably larger. 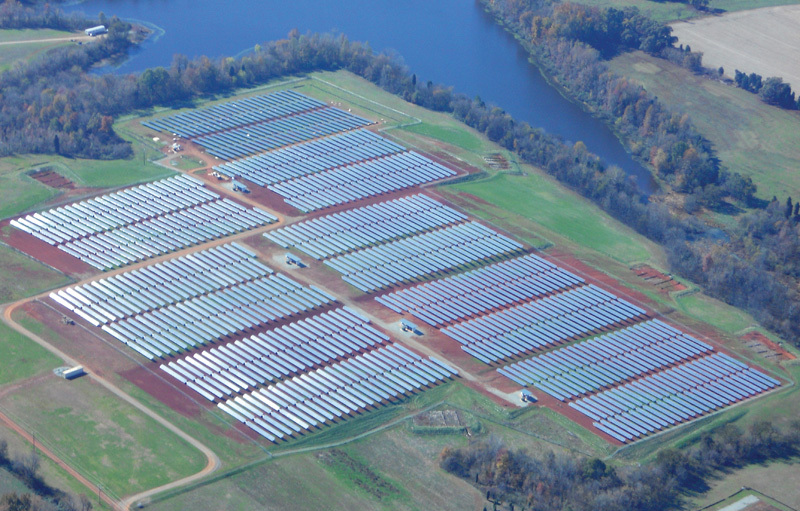 Built in conjunction with partner Duke Energy Carolinas, the solar farm covers 200 acres and is comprised of more than 63,000 photovoltaic solar panels. It is expected to generate an estimated 28 million kilowatt-hours annually—enough energy to power 2,600 homes a year. "It's not a unique design," says Stevens. "We utilized a single-axis tracking technology platform with polycrystalline module technology, so the modules track the sun across the sky." SunEdison also utilized Advanced Energy bi-polar inverters. "We chose the bi-polar inverter platform because it is more efficient than a traditional single polar inverter platform," says Stevens. It is SunEdison's experience in installing numerous solar farms globally, including a 70-megawatt facility in Italy last year, that allows them to assess what works best and when. "Our assessment includes not only the features of the technology, but also quality and pricing as well," says Stevens. "So while this was a good solution for this system, we continue to look at other applications globally." With a ground-mount solar project, Stevens says there are typically three choices. First, you can have a fixed tilt system where you install a rack structure that maintains the same orientation of tilt year-round. Second, you can have a single access tracker installation that tracks the sun from east to west. Lastly, you can choose a dual access power station, where the modules can move both east and west, as well as up and down. "A fixed tilt system will have a lower energy output because it isn't optimizing tracking of the sun. While it may be a bit lower cost, we see the cost of a single access tracker and the increased output from the tracking of the sun to exceed the benefit of a lower cost fixed tilt at a lower energy output." The SunEdison/Duke project was completed in phases, which might seem more expensive—that a company couldn't take advantage of economies of scale. But Stevens says although there are probably some incremental costs with respect to efficiencies, operational execution, and project management overhead, in this case, those costs weren't excessive relative to the overall labor and materials costs of the project. With the SunEdison/Duke project, there were two phases based on the timing of the build—a 4 MW first phase followed by a 13 MW second phase. No matter how many phases a project may entail, the entire project design is typically completed at one time. "We do that because we'll have an idea of the overall project size and the scope of the project. Based on either construction schedules or customer requirements or project financing and timing, we may then build in phases," says Stevens. The Davidson County solar farm covers 200 acres and is made up of more than 63,000 photovoltaic solar panels. It is expected to generate an estimated 28 million kilowatt-hours annually—enough energy to power 2,600 homes a year. For a project the size of this one, SunEdison ideally likes to have it installed in around six months. The Duke project was done in phases because of certain material logistics constraints, and the first phase took approximately five months to install. "We were doing a lot of the development work," explains Stevens. "When we started doing the remaining 13 megawatts, that actually was completed in probably about a six-month timeframe as well. But once again some of that pertained to material supply constraints—module supply was a bit more constrained at that time." In the end, the first 4 megawatts were launched in December of 2009. The remaining generation capacity was launched in December 2010. In this case, as with many projects, SunEdison partnered with Duke to build the project but owns and operates the power station. "For most of the systems that SunEdison develops and delivers under our financing structures, we also perform operations and maintenance responsibilities as well," says Stevens. He adds, "We do scheduled and unscheduled maintenance calls on projects, because we have the expertise and the resources in place to do this better than our customers. It aligns with our model of selling energy. Therefore we manage that asset to make sure it delivers the energy as expected." When SunEdison began working with Duke, the scope of the project included not only designing, building, and operating the system, it also required identifying a site. "We worked with Duke Energy to identify sites that were close to their distribution sub-stations," says Stevens. "Once we located the preferred areas, we chose the site to develop and constructed the system." 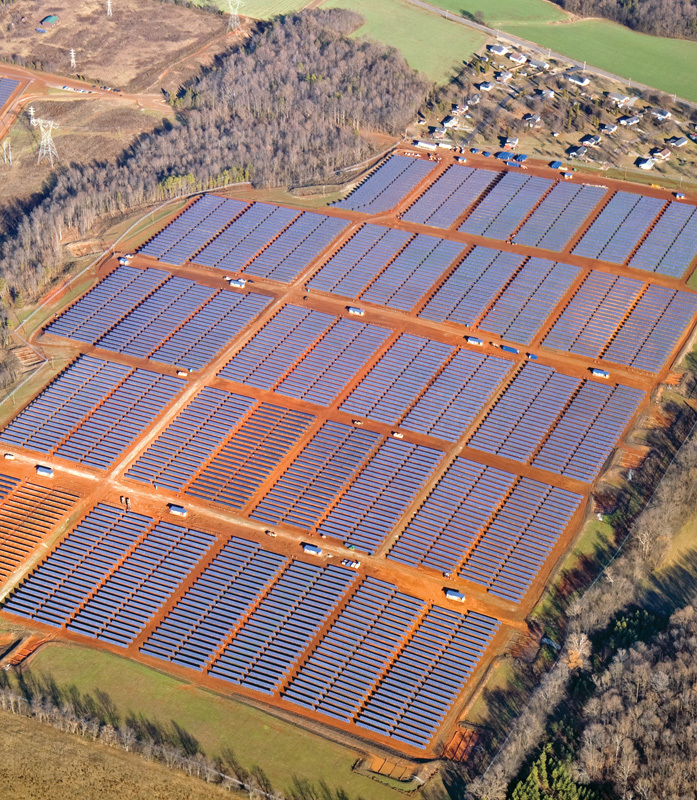 This turned out to be a win/win for SunEdison and North Carolina. "Solar energy continues to increase in importance to North Carolina customers," says Brett Carter, president, Duke Energy North Carolina. "Partnerships, like the one with SunEdison, have allowed Duke Energy to comply with North Carolina's solar requirements in a cost effective way." During development, SunEdison worked well with local parties and Duke Energy. The only big challenge to the project (in addition to its size) was building it in phases. "Some of that was being driven around incentive structures and capacity. Typically, we need to find project investors that can take advantage of available incentives and, in some cases, that may span a couple of years," says Stevens. "As with any new market like North Carolina, it takes some time to work with and identify parties that are able to take advantage of the incentive structure and how that set of structures is established," he added. The Duke project is a substantial addition to SunEdison's portfolio. It is the company's largest operating system in North America and the second largest active solar photovoltaic deployment on the east coast. "I think it was a great example of us working with a progressive utility like Duke Energy to develop a project and get it operating," says Stevens. Also, he feels that the learning curve when installing the initial 4 MW helped create a more efficient overall process not only for this project but others under development globally. "We had the same construction manager on site for both phases of the project," explains Stevens. "So while we used two different contracting parties for the two different phases, the SunEdison project team was able to learn a lot of lessons, collect a lot of operational observations, and incorporate those on the second phase." The efficiencies are evidenced in the construction schedule—five months to install 4 MW and five to six months to complete the remaining 13 MW. Although this may be SunEdison's largest North American project to-date, don't expect it to remain so for long. They have hundreds of megawatts scheduled, and the company is involved in projects going up all over the globe. "We're trying to take experiences like the Duke Energy project that we had great success with in North America and expand that and use the same lessons learned in our global operations," says Stevens. For instance, SunEdison has an operating team in Europe, a team in India that is delivering projects in India and Thailand, and new markets are emerging in China and other regions. Back in the U.S., SunEdison is working on various projects in the southwest. "We've got a portfolio with a utility in New Mexico, five projects, each of them just under 11 megawatts," says Stevens. "We'll also be installing just under 25 megawatts with a utility in Arizona." With all those installations on the horizon, it's no wonder Stevens believes solar has a bright future. "I think there's going to be continued development in the large ground-mount applications over the next several years. Utilities are starting to become more familiar and understand the benefits of solar PV—and because of that, we've seen a huge explosion in interest from the utility section in large scale projects." "As the cost curves of solar continue to drop, there will be a point where the cost of solar energy will be more cost effective, and significantly more rooftop installations will be done. At that point, I think there's going to be a very large explosion in residential and commercial installations. I can see the point coming—four or five years out—when folks will just opt to install a system on their rooftop regardless of incentive structures that might be available." He also believes it will take a great deal of work to get there. "The continued development and alignment between utilities and solar PV integration companies will need to be part of a bigger strategy. We will get to a point where we'll see a significant increase in the potential market for solar, and it will need to be aligned with the interconnection and grid management strategy that we have with the utilities and as a nation. "It's a dynamic industry," he added. "You get a lot of personal satisfaction in seeing the positive changes and knowing that your company had a hand in doing it."